No time to write today - but here's a photo of the turkey. Carved. Sorry, again - I can't seem to remember to take a photo before carving it! Anyway - it was delicious, and once again I used Nigella's recipe. Worked wonders - the bird was brilliant, very moist and flavorful. 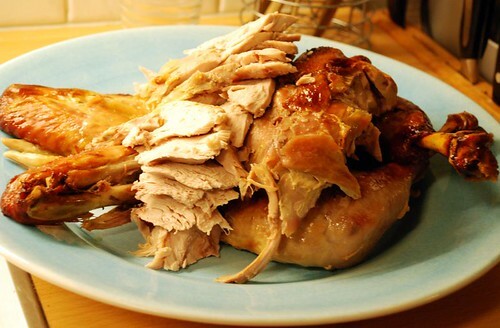 I'm on day seven of turkey leftovers from our Thanksgiving holiday. But your turkey still looks good to me! I love the carved version! The layers look like artwork! Beautiful!